DÉPOT DE LA MARINE. - Carte de cotes orientales de Chine . . .
Carte de cotes orientales de Chine . . . - DÉPOT DE LA MARINE. 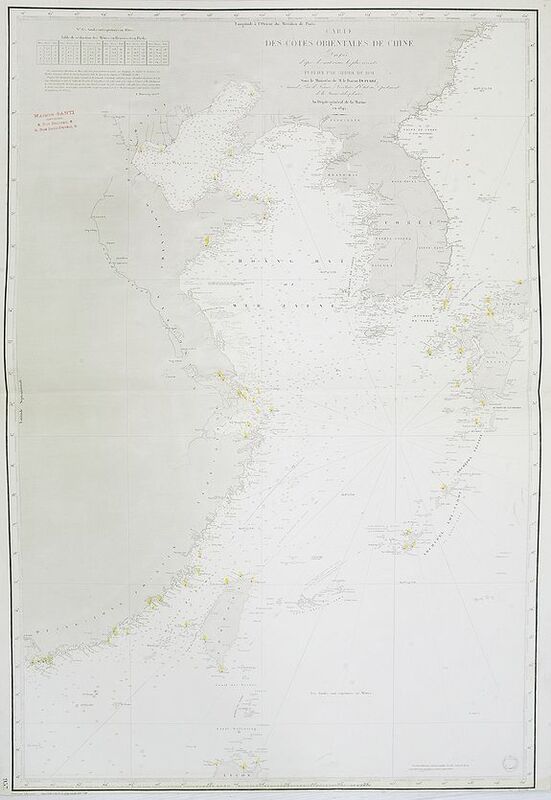 Title : Carte de cotes orientales de Chine . . ..
Map maker : DÉPOT DE LA MARINE.. Date : Paris, 1842, updated 1877. Size : 23.2 x 34.3 inches. / 59.0 x 87.0 cm. Description :Chart of the China Sea, including Korea, Taiwan, and Kyushu island with lighthouse coloured in red dots with yellow. The chart is showing towns, banks, isles and soundings indicated in meters. Engraved by Chassant. Prepared by M.Baron Duperré. Condition : In very good condition. Stamp in red ink of "Maison Santi, Opticien 8, rue Beauvau, 8 6, rue Saint Ferréol, 8."